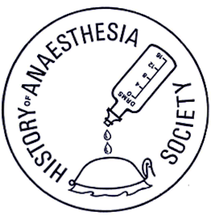 Founded in 1986, the History of Anaesthesia Society aims to promote the study of the history of anaesthesia and related disciplines and to provide a forum and social ambience for discussion among members. Membership is open to any persons over the age of 18 years who is interested in the study of the history of anaesthesia. The Society normally holds a two-day Summer meeting and a one-day Autumn meeting annually. In addition the Society has supported various projects connected with the history of anaesthesia. It funded the restoration of the gravestone of Sir Frederic Hewitt and has contributed towards the restoration of John Snow's grave as well as the Simpson grave in Edinburgh. Donations have been made in connection with the Hickman exhibition in Ludlow, and to the Erasmus Darwin museum in Lichfield. In commemoration of Joseph Priestley's researches into oxygen and nitrous oxide a garden seat was presented to Bowood House. The Society funded the conservation of the Casebooks of John Snow, which are held in the library of the Royal College of Physicians. The Society has reprinted Dr Barbara Duncum's book 'The Development of Inhalation Anaesthesia' and printed 'Essays on the History of Anaesthesia', based on the earlier volumes of the Proceedings. Nominations are now invited for the David Zuck Prize for the best paper or chapter in a book published in 2018. This certificate will be awarded by the History of Anaesthesia Society. The paper or chapter must be sent as an attachment: word-processed document or PDF. The closing date is 22nd May 2019. The winner will be announced at the History of Anaesthesia Society scientific meeting in Cambridge on 14th June 2019.